Should I block the entrance to a wasp nest? Jump Menu: Should I block the entrance to a wasp nest? How to identify a wasp nest? How to identify a Hornets nest? Can wasps build a nest in a hole in the brickwork of a house? Should I burn wasp nest? DO NOT BLOCK THE ENTRANCE TO A WASP, HORNET OR BEE NEST! Blocking a nest is one of the worst ways to deal with a wasp problem. By doing this, the wasps are confined in a tight space and will quickly become agitated. If blocked in, wasps can chew through plasterboard, wood, and various other materials to find a way out. If they start chewing through building fabric to find an exit, they can break through to the inside of the property, and the situation can go from bad to worse as the occupants of the nest empty into the interior of your home. Expanding foam is the most common product used to block nests which can be particularly unsightly and awkward to remove to treat the nest afterwards. If you have blocked a wasp nest, we will require you to unblock it and for the wasps to return to their regular activity before we treat it. Usually, when things do not go to plan, it is due to something odd like the customer blocking the nest or spraying wasp killer into the nest. We tend only to treat nests that have not been interfered with by amateurs. How to identify a wasp nest? The simplest way to identify that you have a wasp nest on your property is to watch any wasps that are outside and see where they head too. Wasps generally use the same flight lines (similar to aircraft), if you notice wasps heading in the same direction and then coming from the same direction, there is a good chance that there is a nest present. If you have a nest in your home, either in the loft or other location on the property, you will see this constant stream arriving and leaving from the nest location. If you suspect that you have a nest, the first place to look is at the roof. If you have a nest in the loft when the nest is large enough it will be obvious where the entrance is. If you cannot see wasps entering into the roof (under tiles) the next apparent places to check will be the soffit areas and facia, any air bricks that are in the walls, around the edges of patios and in your garden shed. Wasp can nest virtually anywhere, even in old mouse or vole holes, so watch the wasps and let them lead you to the nest location. Wasp construct nests from chewed wood and the nest is usually a greyish colour, but colour variations do occur. Both common wasps and European wasps make their nests in the same way from the same material; the only difference between common wasps and European wasps is the nest location. Common wasps nest in houses, sheds, holes in the ground, children's playhouses and various other places — European wasps nest in bushes, hedges and trees and shrubs. How to identify a Hornets nest? Hornets are similar to wasps and classed as a wasp. Hornets are larger than a common wasp (twice the size). Hornet nests are made in the same way as usual wasp nests and constructed from chewed wood. 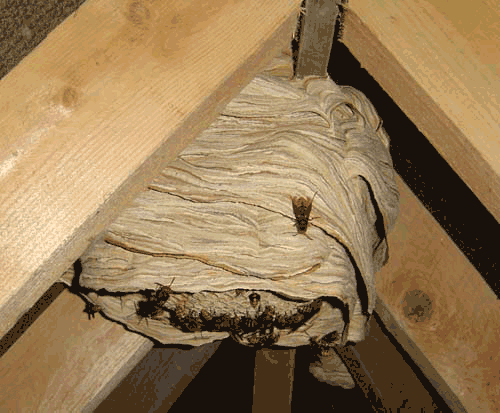 Hornets build nests in many different locations, the favourite places being loft spaces and thatch roofs. The main difference between a common wasp nest and a hornet's nest (apart from the size, hornet nests are generally larger) is the shroud. Hornets build a partial shroud around their nest, the bottom part of the nest is open, unlike wasps which make a complete shroud and leave just an entry hole. A hornet sting is more potent than a standard wasp sting, but contrary to popular belief, a hornet is no more likely than a wasp to sting. Hornets generally only sting when their nest becomes threatened. The treatment of a hornet nest is identical to that of a wasp nest. Hornets do not swarm, only honey bees swarm. We have several photos of hornet nests. As we encounter more nests each year, we will add images to our collection. Please click the link which will direct you to our page with pictures of hornet nests. Can wasps build a nest in a hole in the brickwork of a house? If there is a hole leading into the cavity of the wall, wasps will use this hole and build their nest within the cavity. Wasps need a certain amount of space to build their nests, but this space does not need to be round, it can be flat and long such as a cavity in a wall. Wasps will remove cavity wall insulation to make space for nest expansion. Should I burn wasp nest? No, you shouldn't set fire to a wasp nest. It will not kill all the wasps within the nest or any wasps that are out foraging. By setting fire to a nest, you will send the wasps into attack mode, and you or any bystanders will be attacked and stung.